All births unfortunately do not happen as expected, it can be about complications in the process of childbirth, or abnormalities or diseases in the newborn. But the most delicate part of all this is still the position of parents who must very often make a decision that will definitely govern the future of their child and the relationship they will have with him. A genetic mutation is a modification of the DNA sequence of a particular gene. It generates erroneous information in the process of making proteins. As a result, the proteins become absent, insufficient or deficient. Nowadays, the causes that cause genetic mutations are generally unknown. But their presence is attributed to environmental factors such as air pollution or even radiation. These alterations can also occur for no apparent reason from one generation to the next and cause diseases like that suffered by little Darina. Since his birth, this child has suffered from Treacher Collins syndrome, also called Franceschetti's disease. This disease affects many newborns a year, causing malformations in the face, ears or eyes. A few hours later, after begging the medical team to give him permission to see his daughter, the doctors finally gave in. But by the time she removed the blankets wrapped around the baby, she was so shocked by what she saw that she lost consciousness. 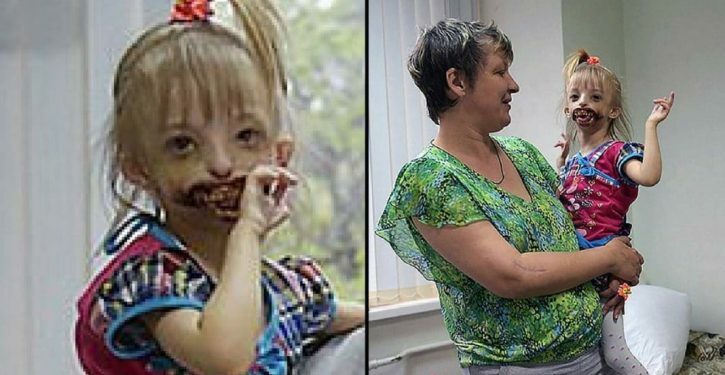 His daughter, Darina, was born with serious genetic mutations that made her without lips or chin, her face covered with blood. The doctors then told her to leave the baby in the hospital and forget about it, but Elena and her husband, Yuri, who lived in the Krasnoyarsk region of Russia, refused to let their daughter enter the sinister world of orphanages . "She is part of us, it's our daughter" is one of the very first sentences that Yuri told his wife. Since Darina's birth, the Spenglers have been the victims of prejudices and slanders of unheard-of cruelty, not only from strangers, but also from most of their friends and family. Some relatives even told the police that Yuri and Elena had disfigured their daughter on purpose. They eventually made the decision to move to escape all of this. "Only my sister supported me. All the other relatives just stopped contact with us. My brothers, their children, my mother-in-law, no one wanted to accept Darina. " But despite the hurtful words and alienation that these two parents were victims of, they never considered abandoning their beloved daughter. "We do not hide Darina from anyone. We take him everywhere with us. My husband is not ashamed of it either. He takes her everywhere. Some people told us to put on a mask, but he said, "If you do not want to see it, just do not look at it. We accept it as it is. " Since the Spengler wanted their daughter to have as normal a life as possible, they wanted her to be educated, but people's reactions to her condition made it difficult. When they tried to enroll her in a local nursery school, she was refused because the school thought the other children would be "scared". So social services send two teachers to visit Darina once a week so she can get a basic apprenticeship, although Elena wants her daughter to be able to go out and make friends. She says, "She's such a social girl. We bought him a lot of toys but nothing can replace friends. " While local doctors did not support them, the Spenglers raised money to pay for medical care in Moscow. There, the doctors told them that the girl will have to undergo major surgery every two years. The three-year-old has already undergone surgery during which her mouth was sewn to make her smaller. The road is still long in front of this brave family, but even if they do not have much support, these incredible parents are determined to continue. And what further proves that they are a living example of love and compassion is that they think that their struggle only makes them stronger and more united than ever. Feel free to share this story around you in honor of this family.